Eleonas consists of 24 independent two-space apartments of 45m2 able to accommodate 1 to 6 persons. They all include an open plan living room with a dining area and a kitchenette with the required cooking utensils. All apartments have a private balcony and air-conditioning. The building’s architectural design respects the surrounding natural environment. The complex is surrounded by beautiful, lush gardens with olive trees, local plants, herbs and flowers. The pool terrace offers our guests a pleasant surprise with its 21mx11m swimming pool and plenty of sun beds to enjoy endless Greek sunshine. The hotel has a large parking space and free WIFI in all the common use areas. Breakfast, car/bike rental, delivery – order out meals from the nearby restaurants. Located in the area of Ixia, Eleonas hotel is just 7km. 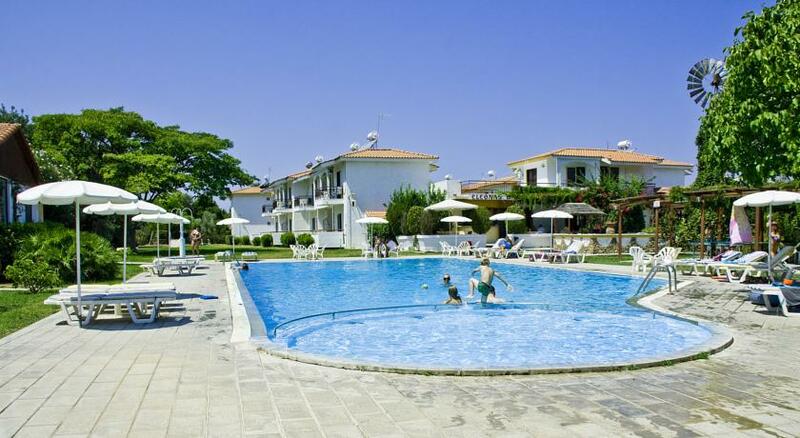 away from the airport of Rhodes and 7km from the city center and the island’s international port. Positioned at a quite countryside lane, amongst groves of olives, oranges and lemons, it is only 600m away from the main street (Iraklidon Avenue), where many super markets, bakeries, restaurants, tavernas etc. can be found. At a distance of 1.200m guests will find the sweeping bay of Ixia with its beautiful beach, ideal for water sports (water skiing, kite surfing, windsurfing…) and plenty of shops, restaurants and cafes.